I am on a mission to explore Turkish Paris, for all it has to offer, the best of Turkish cuisine you can get anywhere in this city. With a large Turkish population in Paris, it is not surprising to see the local Turkish men and women seek to cook and eat the dishes they know. So, this mission is a search for the best neighborhood to buy the unique ingredients of the Turkish cuisine and get you closer to the best stores for Turkish products. As I get out of the metro Saint Denis, I am standing in front of a monumental arch known as Porte Saint-Denis, that marks the beginning of a street that is my target destination. Rue de Fbg. St Denis is lined with many stores and restaurants with Turkish names, welcoming me to a home away from home. It is still early in the morning so the stores are just starting to open their doors and restaurants setting up tables. So, I walk into a typical French cafe for a quick coffee and croissant. As soon as my coffee arrives, so do two gentlemen. They stand right next to me to continue on their discussion, to my surprise, in Turkish. As their heated conversation cools off, I speak up; “Excuse me. 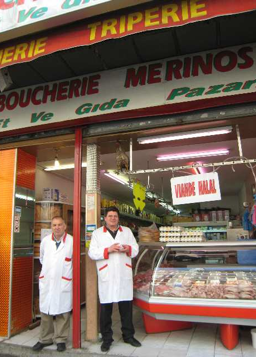 I am doing research on Turkish food shopping in Paris. Would you mind if I asked you a few questions?”. In a few minutes, we are in a deep conversation. 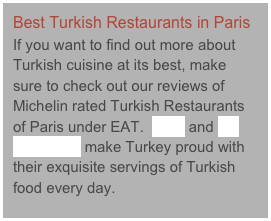 Hasan, a Turkish lawyer who has been living in Paris for many years, has apparently developed a strong opinion about how our cuisine is represented outside of Turkey. Like any Turkish man, Hasan is also a football fan so his long winded speech about Turkish cuisine brings us to soccer, as expected. He says, “I was at a soccer game once. Turkey played against Cameroon. Lots of fans from both sides filled the large stadium. Every time Cameroon scored, there was a loud applause and a repeated slogan I couldn’t understand. After the game ended and Cameroon won, we headed to the Turkish neighborhood for a snack.” Hasan continued, “As we were waiting for our doner ekmek (Turkish gyro sandwich), here it was, the same slogan again, right outside of the Turkish fast food restaurant. Cameroon fans kept repeating; “Ketchup, Mayonnaise, L’Oignon!”. The Aha moment. In Paris, hundreds of Turkish fast food restaurants serving doner sandwiches offer this popular street food with three accompaniments; ketchup, mayonnaise and onions. As soon as you order the traditional Turkish fast food in Paris, you are always asked “Ketchup, mayonnaise or onion with that?” So our soccer opponents are making fun of us, with our food. 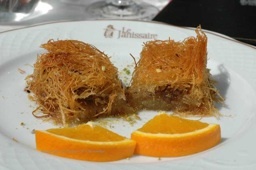 This is how Turkish culture and Turkish cuisine are known to them.” His frustration is growing as he continues, “But our cuisine has so much more to offer.” I couldn’t agree more, Hasan bey! Before I leave the cafe, I ask my new friends for some tips on the local Turkish restaurants and stores they patronize. With Hasan the lawyer as my guide, we walk around visiting Gunes and Rodi, well stocked Turkish supermarkets (Gunes also makes Turkish pita bread in its stone oven right in the store), Merinos, a Turkish butcher with friendly staff and Baklavaci Riza, a baklava store hidden in one of the back streets all within a block radius. Hasan also points out a few Turkish coffee houses, the traditional kind women don’t usually patronize. No doubt I have found Turkish Paris. Whatever ingredient you are looking for, everything you miss, you can find here. 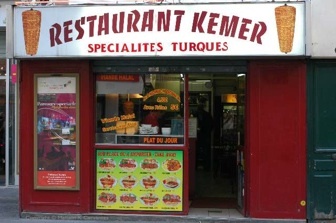 In addition to the Paris version of a Turkish doner ekmek with ketchup, mayonnaise and onion, there are plenty of other options that will better represent our cuisine. Saint Denis is in North Paris, less than 10 minutes ride away from the river or most of the touristic neighborhoods. The best way to get there is to take the metro. The metro lines 4, 8, and 9 all take you to the Strasbourg - Saint Denis stop one block away from Porte Saint-Denis that marks the beginning of the Turkish neighborhood.